The Quiet Birdmen organization is well-known to veteran aviators. The all-male chapters exist all over the world. The building you see here is the home of the Lakeland, Florida, chapter of QB that’s located on the SUN ‘n FUN Campus. The airplane at front is a Fleet NC 431K. It was built in 1929 in Buffalo, New York. 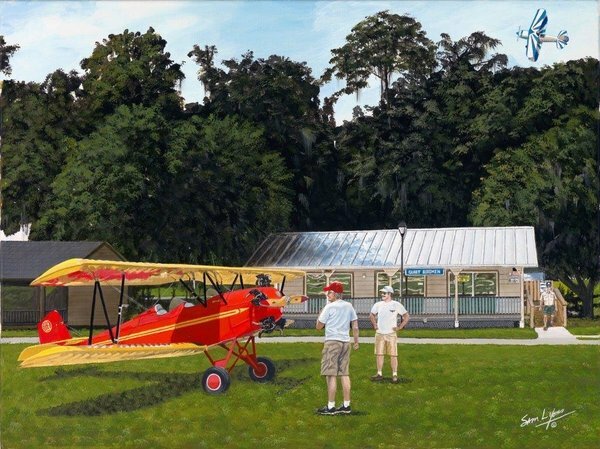 Author Richard Bach is one of its previous owners and he featured it in his aviation novel “Illusions.” The most intriguing fact about this print is its origin. An anonymous — and generous — Lakeland QB member commissioned Sam to paint the original. He didn’t want anyone to know who paid for the original painting but the wonderful piece hangs in the QB building. It’s been a source of great speculation and it’s a wonderful tribute to the popular aviation fraternity.